Browse our full range of NLP Books from leading NLP Developers and Trainers. Now special NLP methods on CD or DVD include Core Transformation, Eye Movement Integration, Personal Boundaries and more. Discover how these methods will help you get the results you want in all areas of your life: relationships, career, and inner spiritual growth. "Thanks again for your time and resources. I can't tell you how much more competent and confident I am since going through some of the books and DVDs you have put out, realizing at the same time there is still a LOT to learn. I used Core Transformation last week for the first time with a client who had a gambling addiction, along with the swish pattern (from Heart of the Mind). She emailed me to say the changes had stuck so far." Two New Video Programs from Steve Andreas! 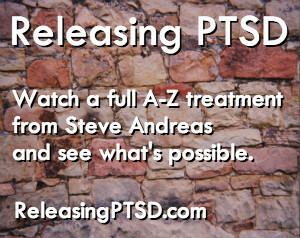 Watch a complete A-Z client session with an Iraq War veteran. 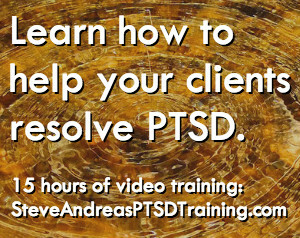 See what�s possible and become a more effective therapist. The perfect companion to The PTSD Training.